Whether you just adopted a new kitten for the holidays or if you have had your pet cat for years, it is important to make sure that you stay on top of regular check-ups at your local veterinarian in the South Coast area. Anchor Animal Hospital in Dartmouth provides a wide variety of care for cats, including feline dental care and Southeastern Massachusetts emergency vet services. Annual check-ups are recommended for cats, with more frequent visits being required for new kittens and older cats, depending on their health. Your vet can make sure that your cat has all of the required vaccinations to keep them safe and healthy year-round. Aside from regular check-ups at your local veterinary hospital, there are other things that you can do at home to help keep your cat happy and well-cared for on a regular basis. Below are some basic and advanced cat care tips that pet owners can use. It is important to understand that each cat is different. Some will respond well to the tips posted below, while for others, they may not fully apply. In other words, when it comes to cats, your mileage may vary. Some cats really love drinking fountains. While they don’t consume as much water as dogs and other common pets, they are really picky about the water that they do drink. Proper hydration is important to your cat’s health, so anything you can do to encourage them to drink an adequate amount each day, the better. Pet drinking fountains are one proven way to get most cats to drink more. 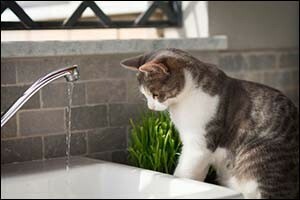 Many cat owners will attest to their kitty’s interest in a dripping water faucet and this is pretty much the same idea. In the wild, cats prefer to drink from running streams rather than stagnant pools – for good reason. Many experts think that this is an instinct that goes all the way back to their wild roots. Cats are notorious for hiding symptoms of illness and pain. Once again, it is their natural instincts that make them feel the need to hide any weaknesses. As a result, cat owners need to be on the lookout for common symptoms that can indicate serious issues. One symptom is panting. While it is common for dogs to pant throughout the day to cool themselves down, it is not normal for a cat to pant. Panting cats can be under stress and displaying their feelings of anxiety or they could be experiencing cardiovascular or respiratory problems. It is important to get your cat to your Southeastern Massachusetts emergency vet right away if you see them panting, just to be safe. Symptoms of a cat in pain can be difficult to detect and can include aggressiveness and becoming more withdrawn, hesitations with climbing or jumping, not using the litter box, as well as reducing or stopping grooming completely. Schedule an appointment at the animal hospital in Dartmouth if you suspect that your cat might be in pain for any reason. Many cat owners are surprised to discover that many veterinarians in the South Coast area recommend canned cat food over dry kibble style food. Some think that dry food is better as part of an overall approach to feline dental care, while others think that dry food is better due to a greater balance in nutrition, however canned foods have something that dry foods don’t have: water content. Most cats are under-hydrated for most of their lives and canned foods are 70 percent water, providing needed moisture. Canned foods are also easier for senior cats to eat and have a higher percentage of protein and fat, which is seriously lacking in dry foods. People naturally look at their pet’s faces to try and read their emotions or feelings on a certain issue or situation, but they should really be checking out their tails. A cat’s mood can be gauged simply by looking at the way the tail is moving. For example, a tail that is swishing around quickly can mean, “go away – leave me alone”, while a tail that is moving smoothly and evenly can mean, “pet me – I love you!” Other signals, include an upright tail, which signifies happiness; a low and erratically twitching tail, which signifies a curious or hunting cat; and a still, non-moving tail, which signifies an uninterested or bored cat. If you have a pet cat and live in the South Coast area, consider bringing your feline friend in for a regular check-up at our local veterinary hospital. Anchor Animal Hospital is also a popular Southeastern Massachusetts emergency vet, which can perform on-site surgeries, conduct testing and even provide physical therapy and other treatments. Give us a call at 508-996-3731 and schedule an appointment or speak with one of our team members to learn more about our services.